Wawasee had a big rally to overcome its county rivals in the Northern Lakes Conference opener for both clubs Monday at Wawasee. The game, shifted to Wawasee due to poor field conditions at Warsaw, saw the hosts score six runs in the bottom of the sixth to take a stunning one-run lead. Delaney Hare singled in a run, followed by a two-run homer by Graceanne Kerlin to pull the Warriors within two. A run-scoring error kept the inning alive, to which Faith Swihart followed with a two-run single to put Wawasee in front. Kiaundra Olson then got Warsaw out in order in the seventh to get the win. Olson allowed one earned run in five innings of relief, striking out five. Courtney Chookie, Katie Anderson and Lindsey Bradley all had RBI singles as the Tigers built a 6-0 lead in the third. Another Warsaw error and a Swihart RBI got two runs back for Wawasee in the third. 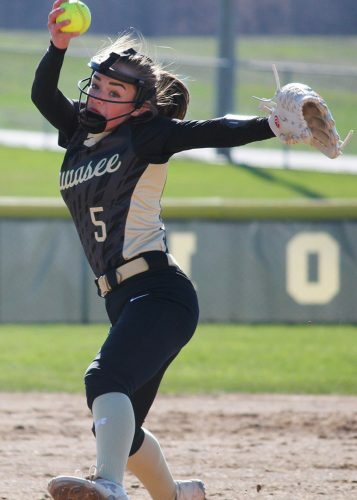 Swihart ended with three RBIs for Wawasee, and Olivia Stuck reached base three times. Bradley, Anderson and Chookie all had two hits for the Tigers. Chookie took the loss, giving up nine hits and striking out five in the complete game. Warsaw took the JV game 15-5. Tori Tackett led the Tigers with a grand slam among her three hits. Karlie German also had three hits for Warsaw. Laney Gross, Autumn Conners, Katy Flannery and Ciandra Ervin all had doubles for Wawasee. Wawasee (5-4, 1-0 NLC) meets Elkhart Memorial Wednesday while Warsaw (2-4, 0-1 NLC) heads to Columbia City Tuesday. Knox was nearly perfect in its dismantling of Triton Monday afternoon. The Class 3-A No. 8 Redskins hung a 10-spot in the first inning and coasted from there. The bottom of the first had Knox start the inning with a walk, then following a fielder’s choice, had four straight singles and a three-run homer from Jayla Williams. Riley Geotz and McKenzie McIntire later added two-run singles to get Knox into double digits on the scoreboard. Triton managed its only baserunner and run in the fourth. Madeline Doll reached on a walk, stole second, then came around to score on a Knox error off the bat of Skyla Wilson. Doll was the only Triton player to reach base in the game, largely by the doing of McIntire, who struck out 10 in the five-inning contest. Knox pounded out 17 hits and took eight walks in the contest. McIntire had four hits and three RBIs, Courtney Singleton had three hits and three runs, Williams scored three times and drove in four, and Geotz drove in three. Triton (3-6) stays on the road for a Tuesday contest at Class 1-A No. 1 Pioneer.